We email discounts and specials once a month to our customers with a new special every time. Join and receive offers today! We are looking for candidates eager to learn and thrive in a new career path. Apply Today! Martinizing Dry Cleaning offers services that pose no threats to the air, water, people or soil; giving your products — and the earth — the best clean possible! 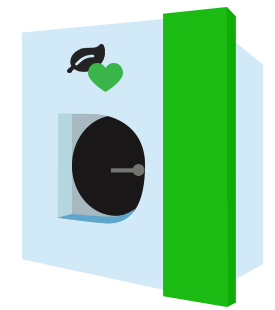 We recycle hangers and poly bags and are a Certified Encironemental Dry Cleaner and a 4 Star Cleaner in a partnership with the Department of Natural Resources. At Martinizing Milwaukee Dry Cleaning, we have chemical agents, equipment and experience superior to any household solution you might try. Don't take chances with your garments-- take them to MARTINIZING instead. Martinizing Dry Cleaning is a family owned and operated Milwaukee dry cleaner providing dry cleaning and laundry services to customers throughout Southeast Wisconsin for over 50 years. Martinizing Dry Cleaning is an industry leader in garment care quality, customer service and environmental responsibility. Browse our laundry and Milwaukee dry cleaning services and see why we are Southeastern Wisconsin's number one quality, full service launderer and dry cleaner. In addition to dry cleaning and shirt laundering, we specialize in wedding gown cleaning and preservation as well as uniform cleaning. As a certified restoration dry cleaner we work with insurance companies to restore clothing and fabrics after fire, smoke, or water damage to get your Wisconsin home life back after disaster strikes. Martinizing Dry Cleaning’s long list of professional services also includes tailoring. We offer Milwaukee tailor services to alter designer dresses, dress suits, jeans, leather, winter coats and all other garments which no longer fit properly. Our professional tailors and seamstresses take on projects as small as mending tiny rips and tears to wedding gown alterations. The convenience of our tailoring services cannot be beat by our competition. We offer personal tailor appointments to fit your schedule, as well as pick up or delivery services. When your garment is finished, either stop by to pick up your clothing or let our delivery service specialists drop it off at your home free of charge. Visit your local Martinizing Dry Cleaning location for an alteration appointment today. Martinizing Dry Cleaning now offers FREE pick-up and delivery service. There’s no reason to spend time running to and from the dry cleaners when you can get the best service from here to Milwaukee, west to Oconomowoc, north to Grafton, east to Shorewood and back south to West Allis to pick up and deliver your dry cleaning right to your doorstep everywhere in between. FREE pick-up and delivery makes Martinizing a complete no-brainer. Once you order FREE pick-up and delivery from Martinizing Dry Cleaners, doing your laundry is as simple as putting it in a Martinizing bag and setting it on your front porch. You get the same low rates charged in our stores and you can still use coupons. With dry cleaning delivery service from Martinizing Dry Cleaning, you have nothing to lose and lots of time to gain. You can even set clothing items aside with special dry cleaning instructions or order delivery of garment care supplies like lint rollers and fuzz combs to get the results you want. Once you get your routine going with twice weekly dry cleaning pick-up and delivery from Martinizing, you’ll wish everything in life could be so easy! With automatic billing to your credit card and regular pick-up and delivery times, Martinizing makes dry cleaning so effortless, you’ll wonder why anyone would ever choose another Milwaukee dry cleaner. Martinizing has more experience with every type of fabric and every possible type of stain, as well as a wider variety of dry cleaning and garment restoration services than any other Milwaukee dry cleaner. This expertise makes Martinizing dry cleaning and stain removal technicians the superior choice for Milwaukee dry cleaning. Try Martinizing Dry Cleaning pick-up today to experience the best dry cleaning service in Southeastern Wisconsin, right at your front door. See how much easier your laundry and dry cleaning can become. 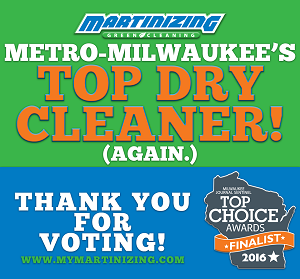 Once again, Martinizing has been named one of the best dry cleaners in Wisconsin! 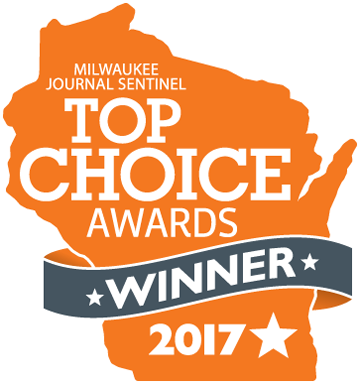 We have been honored by the Milwaukee Journal Sentinel as a Top Choice Awards Finalist for 2016 as Metro-Milwaukee’s Top Dry Cleaner. We are proud to offer wide range of laundry services with a level of quality you won’t find anywhere else. Our many convenient locations, combined with our free pick up and delivery service, makes laundry easy across southeast Wisconsin. Thank you to all of our customers for voting for us. If you still haven’t tried our services for yourself, now is the perfect time to call! Martinizing Dry Cleaning recognizes your clothing is an investment as well as an expression of who you are and you can trust us with making you look your best. Contact Martinizing Dry Cleaning for environmentally responsible dry cleaning services. Call our corporate office to find the closest location to you at 262-521-9710.